Golden Apples: Not Knitting, Not Sewing, Either! So I made some progress on one camp shirt one--(navy blue) until I ran out of navy blue thread, too! So with a growing list of notions, and Tuesday night knitting cancelled-- I headed out shopping—and got some of what I set out for, and made some un-planned purchases, too. 1st—2 more cuts of cotton forced there way into my shopping—I just love the colors of both of these prints. One will become another wrap skirt, the second—an other style I think—because as much as like the wrap skirt—well, 3 of them are enough, don't you think? And, of course, some matching poly/cottons joined in the fray—both of these selection of cuts were further reduced (or I wouldn't have even looked at them) so these skirts & shirt sets are going to be even cheaper--(under $20 for each set!) --included a bag of mixed buttons—I wanted to buy more (there were so many prints that were just so pretty!) but the tight rein I keep on my purse won out over my heart. These jewel-tone colors have been part of my wardrobe staples forever. I always maintain, I don't have a favorite color—but I am a sucker for blues, purples, and turquoise—especially in the summer. Plus, the purple solid will also match the black calico skirt, and the solid turquoise goes well with both of the new prints. I got my interfacing, too, and black thread (I went for 2 spools—I have 2 more black skirts to alter, and a piece of black linen to sew up as well) and some turquoise to match both the print and the poly cotton—since I knew I didn't have any matching thread at home--afterwards, I realized, I should have pick up a bag of turquoise buttons, too. 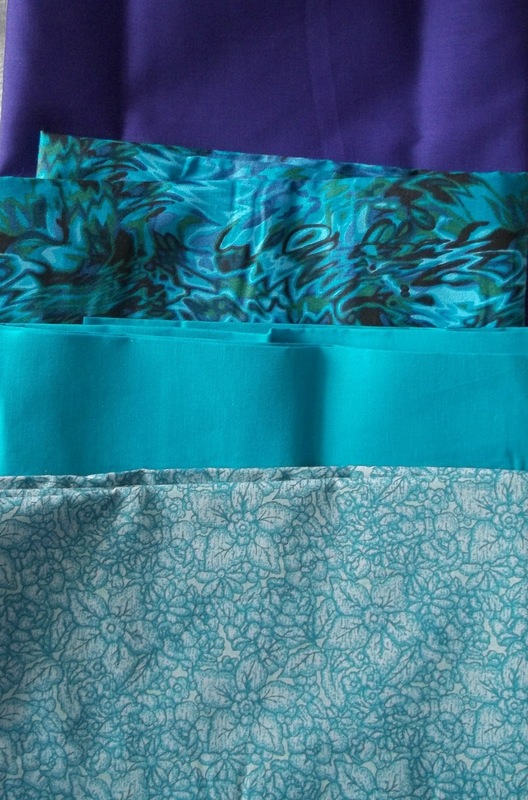 And from the clearance bin, some short (and not so short) bits of elastic--a small bag of assorted widths and lenghts—great for adding to too loose waist bands. I meandered a bit--doing a bit of window shopping, too. and got home late—and was treated to a lovely sight along the way. The mornings rain had given way to cloud cover—that was breaking up—some clouds were low, and dark (a deep prussian blue) and the dusk sky, a dark royal—pretty looking just for the play of colors. And then there in a break between the clouds—a sliver of moon. It only lasted a few minutes—the clouds moved, and the break closed, and the moon continued its downward way—but for a minute—It was just breathtakingly lovely. It was a good thing the apparition only lasted a minute or two—I was headed home, and traveling on the LIE (I-495), doing 60PMH or so, at the time, and taking my eyes off the road, wasn't really a good thing! So—some more sewing today—at least to finish the navy camp shirt-- and then some knitting—the shawl is crying its eyes out (Oh so many eyes! ), over being abandon. One of the sweetest things about trimming down is the chance to make new clothes. I'm a fan od camp shirts, too. I love the look of them. Enjoy your sewing, the thought of summer at the pool, and being all "put together". And of course, the knitting.